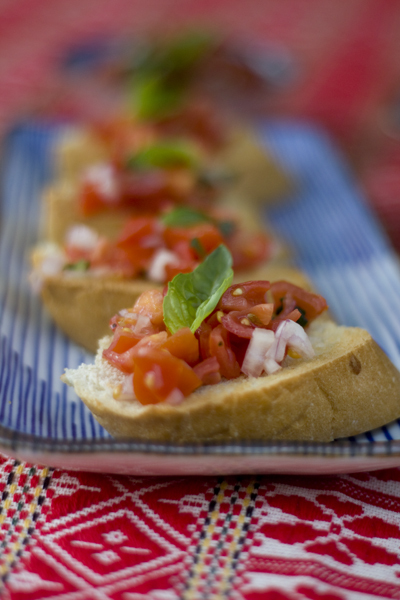 Bruschetta is a favourite of mine in the spring. The basil leaves and grape tomatoes are fresh, and I can sit on the porch, close my eyes and pretend I’m actually in Italy, and not in Canada where there’s a good chance the clouds will come out of nowhere and it will start hailing. This tends to happen when I’m heading outside in shorts, a tank top and have a scrumptious spread of food with multiple plates. Sigh. 1. Put oven on broil setting. 2. Slice baguette, and brush olive oil on the slices. Put slices in the oven and bake for 2-3 minutes, watching closely until edges are browned. 3. 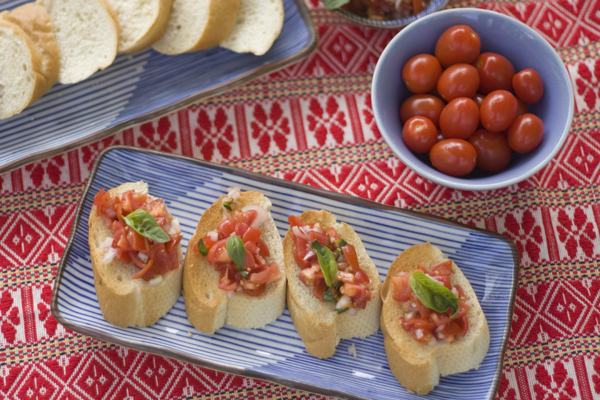 Slice grape tomatoes into small pieces and put them in a bowl along with shredded basil leaves, salt, pepper, oregano, olive oil, balsamic vinegar and shallot. 4. Mix ingredients until well combined. 5. When baguette slices are browned, remove from oven and rub the garlic clove across the top of each baguette to enrich it with flavour. 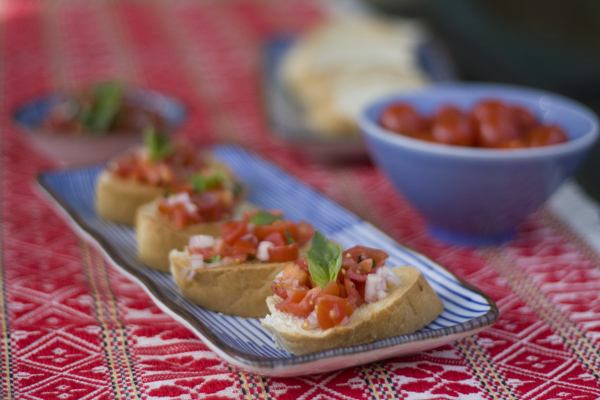 Top slices with bruschetta. Great idea; always nice to have a quick and refreshing snack on hand!